Despite Russian military actions, Ukraine has shown itself unprepared for total war, hoping against hope that the West will come to its rescue. But ever more open Russian aggression and ever greater recognition in Ukraine that the West isn’t going to may soon force Ukrainians to consider what they have to do on their own to avoid total defeat. Specifically, he says, “the unreadiness to fight must not be confused with the inability to do so.” Ukraine has options. That situation ended only in November 1994 when Ukraine ratified the non-proliferation accord and sent these weapons to Russia. 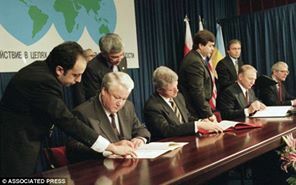 Boris Yeltsin (Russia), Bill Clinton (USA), Leonid Kuchma (Ukraine), John Major (UK) sign the Budapest Memorandum with security assurances against threats or use of force against the territorial integrity or political independence of Ukraine, Belarus and Kazakhstan. None of the three powers has behaved as that memorandum requires. Russia has seized Crimea, invaded the Donbas and used economic pressure to try to break Ukraine. Meanwhile, the US and the UK have failed to take any serious steps to force Russia to live up to its commitments. 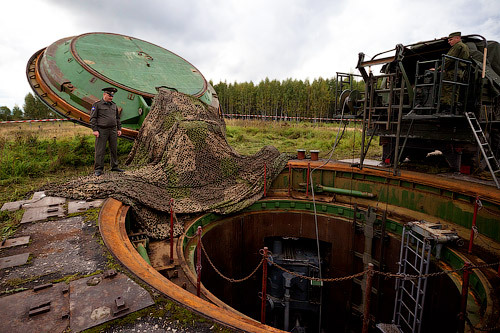 In 1994 Ukraine was accessed to the Nuclear Non-Proliferation Treaty as a non-nuclear weapon state. “But for this, three conditions must be met,” Pastukhov says. First, “the nation must experience the unbearable pain and shame of a catastrophic defeat,” the kind Moscow seems to want to inflict. Second, Ukrainians must “stop waiting for help from abroad.” That isn’t likely to come. Russian actions like those in the Kerch Straits in the last few days “are pushing Ukraine precisely toward that ‘policy of despair,’ the consequences of which are very difficult to predict. The absence of punishment for the aggressor may turn out to be an illusory dream,” the historian continues.